China has a centralized system. When there is a wise leader like President Xi Jinping, it is able to conduct a thorough reform of its outdated military system and organization structure that dated back to mid 1950s. The West especially the US criticizes the Chinese system and calls it autocracy. However, they do not understand that it is centralism with democratic discovery, employment and trust of talents with a wise leader able and powerful to do so. In addition, China has a culture of constant reform that has developed in its four decades of reform and opening-up. China is now switching to innovation- and creation-led economic growth. It is especially so in Chinese military so that China is able to catch up and surpass the US so quickly. The US may invent the lies that China can catch up so fast because China has stolen US technology, but now China has been developing what the US does not have such as quantum telecommunication, aerospace aircraft, etc. It forces the US to improve and attach importance to innovation. However, as pointed out in Defense One’s article “All This ‘Innovation’ Won’t Save the Pentagon” that US military’s organization structure is outdated. It hinders innovation. For example, US acquisition of weapons “is roughly the opposite of how modern products are developed”. The article says, “It enumerates numerous, often overlapping or contradictory ‘requirements’ before production is even thought about. The process takes years, as shown by albatrosses like the Air Force’s F-35 and the Army’s Distributed Common Ground System.” Due to the long process of development, the weapons finally acquired “are artifacts from a bygone era before they’re ever even delivered”. The US does not lack talents, but the military is unable and its organization structure and culture make the military unable to give play to US talents. China has a long history of fighting for the throne in Central Plains (in Chinese “中原逐鹿”) that has developed a tradition that the one who gets talents wins the throne. The first winner Emperor Gaozu of Han won the throne as he got lots of talents and employed them wisely. He knew that and told other about his experience but did not know that he had to employ talents after he had won the throne. When he heard the advice that he had to employ civilian talents when he had won the throne, he retorted, “I got the empire on horseback, what is the use of poems and history?” He got the reply, “your majesty has got the empire on horseback but has to get down horseback to rule the empire.” The emperor obeyed and was thus able to rule the empire successfully. All later founders of empire followed Emperor Gaozu of Han’s example. Mao, the founder of the People’s Republic of China, however, persecuted talents while employing uneducated rebels among workers and peasants to rule the country. He almost caused Chinese economy to collapse by so doing. Deng Xiaoping and his successors learnt from the lesson of Mao’s failure and began and have continued China’s reform and opening-up, which is in essence the recovery of China’s long practice of respecting and satisfactorily employing talents. The reform focuses on two unswervinglys, i.e. unswervingly consolidate and develop state-owned economy and unswervingly support, encourage and guide the development of non-state-owned economy. For state-owned enterprises, China selects and employs talents and allows them to have autonomy in running the enterprises. For non-state-owned enterprises, China encourages and provides financial and other aids for talents to become rich through the establishment and development of private enterprises. Such Chinese tradition also prevails in Chinese military. Talented scientists and engineers are highly respected and have top authority in designing, making and operating advanced weapons and equipment. 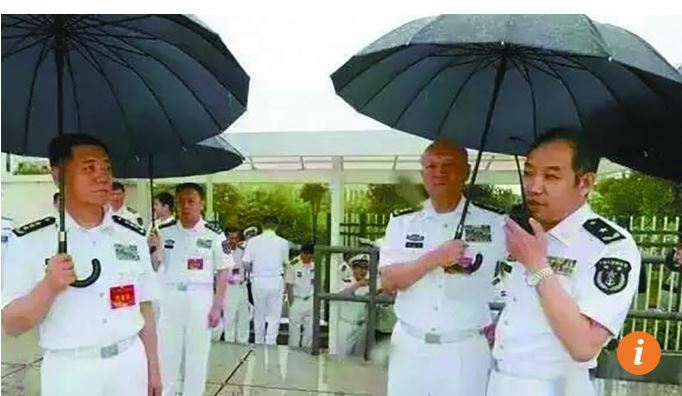 The following photo shows how China’s navy commander-in-chief admiral Wu Shengli holds an umbrella for Real Admiral Ma Weiming, China’s developer of electromagnetic catapult and integrated electric power supply and propulsion system for warships. China has a Made in China 2025 plan that urges local officials to discover, respect and support with funds startups, which US elite fear so much as they have tried hard to force China to scrap it with a trade war. However, getting down from horseback to rule the country is a major Chinese tradition of more than two thousand years that will keep on making China strong and prosperous whether on not the plan will be scrapped or not. China will keep on winning its arms race with the US if the US keeps its culture of neglecting scientific and technological talents. What does the US have? There are no talented scientists or engineers in US military. Popular Mechanics’ article “Disrupting the Pentagon: Can the Air Force Learn To Love Startup Culture?” shows a little improvement in US military. The article describes US Air Force’s efforts to attract startups in science and technology by the establishment of open offices across the country for that. However Air Force Vice Chief of Staff General Wilson only visited an office for a few days to learn the new technology. Where are USAF’s top commanders. They do not visit the offices or meet the startups. Perhaps they are not interested. Even if they are, they have no common language with science and technology startups due to their technology illiteracy. They cannot find, employ or respect talents as there is no such tradition in US politics and military. Chinese leaders including military ones study science and technology hard and are able to discover, respect and satisfactorily employ talents whether civilian or political, including science and technology talents. Such a tradition, such a culture have enabled and will enable China to catch up and surpass the US quickly if there has not been any reform in the US to learn from China’s reform, tradition and culture. It does not seem likely that the US may learn from China. The US remains arrogant now about its messy liberal democracy and looks down on China though fear China’s rise. China has Russia as its ally in its arms race with the US. The two have division of labor with China mainly developing navy to put an end to US dominance of oceans and Russia mainly developing nuclear weapons. Limited nuclear weapons are quite enough for China as it only needs second-strike capability due to its promise not to be the first to use nuclear weapons. Russia has not promised that, the US has to have enough nuclear weapons to deter Russia’s first nuclear strike. Due to the division of labor the two allies China and Russia each has its focus of military spending so that their much smaller military budgets are sufficient. The US regards both China and Russia as its enemies so that it has to allocate its military budget to development of both nuclear and conventional weapons. Its military budget is not enough though much larger than China’s and Russia’s. The US does have allies, allies of mutual defense treaties, but the treaties are in fact not mutual. The US has the obligations to defend its allies but its allies are not capable or willing to defend the US. US European allies rely entirely on US defense of them so that they are not willing to increase their military spending for their own defense. Trump has tried to win over Russia to reduce America’s enemy, but most Americans oppose that. They want both Russia and China to be their enemies in spite of China’s success in developing conventional weapons to catch up and surpass the US and Russia’s development of new advanced nuclear submarines and ICBMs to threaten the US. Who will win in an arms race between a hard-up US and the Chinese and Russian de facto alliance that does not lack financial resources? However, US military leaders do not know US military itself, nor Chinese military. National Interest’s report “Dogfight Destiny: Why China’s J-20 Stealth Fighter Can’t Beat an F-35” on US Air Force chief of staff Gen. David Goldfein’s statement to reporters on Aug. 10 offers a typical example of US military leader’s strategic illiteracy. The report can be viewed at https://nationalinterest.org/blog/buzz/dogfight-destiny-why-chinas-j-20-stealth-fighter-cant-beat-f-35-51247. Chinese media have published lots of reports on the network capabilities of Chinese military, including air force. For air force, the network includes ground command with network of radar and super computer, AEW&C aircrafts and formation of J-20s and accompanying fighter jets, fighter bombers and bombers and navy fleet in the combat. In attacking China, US F-35s have only the network of its own formation as US fleet and AEW&C aircrafts cannot come near the formation to support the formation for fear of being downed and sunk by China’s saturate attack of ballistic, cruise and other missiles. As a result F35s’ network is inferior to J-20s’ by far, but the general is entirely ignorant of that. The US general does not know his enemy! He does not even know US military itself, especially F-35. F-35 has lots of problems. US GAO’s report points out in its report that F-35 has 966 significant defects, among which 110 are major ones that may lead to death or injury of pilot or temporary cessation of production. Has such problems been overcome? Not seems so. On September 28, 2018 an F-35B crashed in training in South Carolina but US military remains ignorant of the safety problems of F-35 so that on April 9 another F-35 crashed during training in Japan. The general cannot be sure that F-35 will not be beaten by J-20 as he does not know China’s network, but he can be sure that F-35 is able to kill its pilot in air in combat as F-35s have been quite busy in crashing during training though the number of F-35s is not large so that there cannot be much training. The general must be aware that F-35 is so unsafe a platform that comparison of it with J-20 is “an irrelevant question”. What he can be sure is that F-35 is able to kill itself along with its pilot. US military claims that it is the best equipped in the world, but China has developed better stealth fighter jets than its F-35. China knows US military so that it is able to make J-20 a platform better than F-35. That is why the American general does not want to compare F-35 with J-20 as a platform. However the US does not know J-20’s network capability. How can the US win in arms race when it ignores its own weapon F-35’s safety problems and unable to know its enemy’s J-20? Article by Chan Kai Yee. The US has a much larger military budget but is unable to turn out as many advanced weapons as China does. The US has been one of the richest countries for decades. Its people, especially its military, have been used to excessive spending to boast that the US is the best in the world. As a result, it makes very expensive weapons for show but forget that it has limited financial resources. China, on the contrary, was one of the poorest countries in the world for decades. Its people, especially its military, have got used to thrift. They pay great attention to cost effectiveness in developing and making weapons. They showcase their advanced weapons not to give the impression that they are the best in the world but to deter US planned attack at them. As a result, China is able to turn out more weapons of as advanced performance as America’s with a much smaller military budget. China’s economy is growing fast though a little slower than its past while the US has difficulties to maintain a much less growth rate. As a result, China’s resources for development of its military will keep on growing while the US has to rely on additional borrowing for its military. Now, China is diverting its surplus foreign exchange from purchase of US treasury bonds to its Belt and Road initiative, which will reduce US source of borrowing. It is obvious that a hard up US cannot win its arms race with a China with abundant financial resources. In China, soldiers are recruited by conscription, which enable Chinese military to choose the best in term of fitness and physical and mental abilities from a large number of candidates in the age group from China’s huge population. Soldiers join Chinese military not as jobs but due to their obligations of national defense. Due to prevailing patriotism, Chinese soldiers are willing to fight and even die for the defense of their motherland. As most US wars are wars of aggression few Americans are willing to join the military to fight the unjust wars. As a result, the US has to abolish its conscription system. Now, US soldiers join the military as their jobs to earn a living instead of to fight for the defense of their motherland. Due to the compulsory junior secondary education and popularization of senior secondary education most Chinese soldiers have received at least junior secondary education. Due to keen competition among secondary school students for opportunities of further study, the quality of education is very good. Moreover, due to the competition most students have obtained in schools the habit of working hard. In the US personal liberty prevails so that playing hard instead of working hard are in vogue in secondary schools. School graduates join the military to get their jobs as soldiers to make a living instead of fighting, even less dying, for their motherland. The fast upgrading and renewing of weapons and equipment require member of military especially petty officers to work hard to learn the new technology. They have to be able to operate and train soldiers to operate upgraded or new weapons and equipment. Not only Chinese petty officers work hard to learn, but Chinese military authorities take hard measures to help them learn by sending them to military schools, colleges and training courses to enable them to master the new technology, weapons and equipment as soon as possible. PLA Daily’s article “Professional type of soldiers stand out prominently: Northern Theater take hard measures to train them” on April 7 gives a typical description. Members of Chinese military have the habit of working hard since they begin to receive school education. They work hard in the military in order to better defend their homeland. Members of US military mostly do not have such habit. They join the military to earn a living and enjoy their life. The military gives them training to make them able to operate their weapons and equipment. However, the military lacks funds for training while its members lack the urge of patriotism to improve. The two recent incidents of collision between USN destroyers and commercial ships causing casualties in peace time are typical examples of US military members’ loose discipline and neglect of duties. They would rather sleep instead of keeping wake to take care of their warships, let alone working hard to learn new technology. Comment by Chan Kai Yee on PLA Daily’s article, full text of which in Chinese can be viewed at https://military.china.com/news/568/20190407/35605747_all.html#page_1. Critiques may say that Trump sees that the US is losing its arms race with China and Russia due to US military’s incompetence in weapon development. Its true China is catching up quickly and may soon surpass the US as China recruits scientific and technical talents into its military to be in charge of weapon development. Chinese military colleges recruit talented students and give them education and training not only on the art of war but also science and technology. In addition, Chinese military recruits scientists and engineers among civilians. As a result, Chinese military officers have no difficulties to operate sophisticated equipment. US President Donald Trump opposes the use of electromagnetic catapult on US new aircraft carrier as he believe the equipment is too expensive and complicated for US military to operate (see Task & Purpose’s report “Trump Was Right: The Navy’s ‘Digital’ Catapult Really Is An Expensive Mess” at https://taskandpurpose.com/trump-aircraft-carrier-digital-catapult). US military simply does not care. It develops weapons in the manner similar to rich children’s choice of expensive toys. Yes the toys are expensive but our parents are rich enough to pay for them. What if the toys prove unsatisfactory? Lay them idle and our fathers will buy us some others. That is those boys’ mindset. US military’s mindset is similar. Yes the weapons are expensive, but the taxpayers are rich enough to pay for them. Zumwalt class destroyers and littoral combat ships are typical examples. Therefore, in spite of US huge military budget, US military is always short of money and ask for more. Trump is very clear due to US military’s incompetence in science and technology, China and Russia will soon surpass the US in the arms race. He is clever to suggest suspension of arms race to maintain the status quo of US military superiority. That, critiques believe, is his trick, but I would rather believe that Trump really believe divert the funds from arms race will be better for American people’s benefit. If he can build up trust between the US and China through the trade war negotiations, he may begin talks with China for arms reduction. As for Russia, American congress and media’s hostility towards Russia seems very difficult to overcome. Comment by Chan Kai Yee on Reuters’ report, full text of which can be viewed at https://www.reuters.com/article/us-usa-trade-china-russia/trump-laments-military-spending-by-us-china-and-russia-floats-deal-idea-idUSKCN1RG2UN.